Dr Maria Bargh, is a Maori Studies lecturer at Victoria University, Wellington. 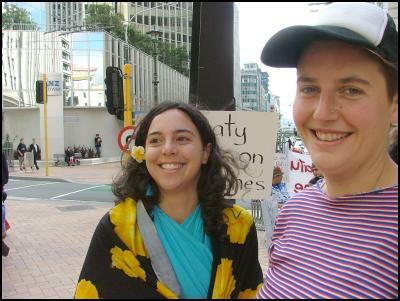 She is one of a generation of Maori activists, pushing hard for "Tino Rangatiratanga" (Maori sovereignty), while actively opposing "neo-liberalism". Lecturer of Māori Politics, Māori Resource Management and the Iwi Internship. Politics of Indigenous peoples, globalisation, diverse local political economies, neoliberalism in the Pacific. Neoliberalism is Re-colonisation in the Pacific, Just Change, Issue. 2, March 2005. Book Review, Political Science, Vol. 56, No. 1, June, 2004. Maria Bargh has been active on the NZ Maori left and anti free trade movement, for at least a decade. In 1997 she was on the executive of Victoria University's radical Ngai Tauira Maori student's organisation. The same year Bargh was active in the anti free trade "Anti M.A.I. Action Group". According to Bargh, the group is made up of Maori and Pakeha students, Grey Power, CARITAS, Alliance, PIRM and others. In early 1998 Bargh wrote an article in Victoria University's student magazine "Salient" Number 3, on "Peoples Global Action Against Free Trade and the WTO". On September 26, 2000, Bargh co-signed with Teanu Tuiono, Helen Te Hira and Tauni Sinclair, a press release condemning the NZ/Singapore Free Trade agreement. Tino Rangatiratanga advocates attending the Prague anti-World Bank, anti-IMF protest say that New Zealand will face the same types of action if the Government pursues the Singapore Trade deal. In 2004, Dr Bargh helped organise the nationwide "Hikoi" protesting against the labour government's Seabed and Foreshore Legislation. In 2005, Bargh wrote "Neoliberalism in Aotearoa and the P3 - G8 not making poverty history", for "Struggle", No.118. ...is a non-profit organisation committed to promoting informed debate and action to protect the rights of indigenous peoples within Aotearoa and around the world. The Trust raises funds that are used for increasing awareness about the rights of indigenous peoples within Aotearoa and for assisting Maori to attend international meetings of indigenous peoples and the United Nations. The DRC's board is chaired by Dave Cuthbert, a long time Maoist activist, once named by the Security Intelligence Service as a probable member of the Workers Communist League. Flirting with socialists and socialism, will do nothing for the Maori cause that Dr Bargh espouses. Tracically, Dr Bargh, like many young Maori leaders, seems to spurn the free markets that would do more to improve Maori economic and social wellbeing than anything else. Hopefully, Dr Bargh will one day realise that freedom will serve NZers of all races, better than any form of socialism, including "Tino Rangatiratanga". it is a nice photo, you would never guess she is a key part of the communist conspiracy eh Trevor? No. She looks like she should be working at Macca's. funny you look like someone i saw in their underwear spouting communist conspiracy theories...oh that WAS you. So Trev, what exactly is your/the libertarian attitude to the Treaty - presuambly it's considered a contract that the state needs to ensure is honoured? And as I recall, you've been pretty strong on national defence issues elsewhere - so I guess you'd back the right of, for example, Waikato iwi to take up arms to liberate their country from the occupiers? I hold a pretty straightforward view really. The Maori ceded sovereignty to the British in exchange for protection from the French, each other and for British law. I regard the "partnership" idea as a later leftist "add on". My hero Thomas Jefferson had a saying that went something like "The tree of Liberty needs to be fertilised regularly with the blood of tyrants. I don't know the background to the Waikato Wars. Perhaps Tainui were justified in taking up arms, perhaps they weren't. Whether justified or not, taking on the British Empire wasdoomed to failure. Sometimes rebellion is justified, sometimes it isn't. I certainly see no justification for rebellion in present day NZ. Every new nation is forged in blood. NZ was very fortunate that so little was shed. In my opinion, Maori should work through the courts to address any past wrongs and spend most of their energy focussing on the future. Tino Rangatiratanga is counterproductive and a waste of time in modern NZ-unless you want a revolution of course. I agree with you that 'partnership' was a later 'add on', though I'm not so sure if it was a particularly leftist idea. While it is certainly expounded by many left social democrats, it seems to me to have been invented to avoid the legal consequences of a literal reading of the Treaty. As for the Waikato war - it wasn't Tainui (and others) who took up arms, but the colonial government. Tainui merely defended themselves. Telling them to seeek redress through the courts is a bit like telling the Tibetans to go to court if they have a problem with being invaded and occuopied. When the invader runs the courts you can't expect justice. Besides which, the government has clearly demonstrated (over the seabed and foreshore issue) that it will legislate to prevent Maori taking grievances to court if it looks like they have even a slim chance of winning. Maria Bargh looks like a very friendly happy person from the picture you have posted. Sam-If i was being done over by Beijing, I would be quite justified in taking up arms. The NZ government, has comparitively speaking been a very good one. Maori have won substantial court actions against the NZ government. It ain't perfect, but then life never is. There is no justification for political violence in this country. BTW Sam, ACT was about the only Party to support the right of Maori to test their Foreshore and Seabed claims in court. Why do you think that was Sam? Cameron. Thanks for the links. The world is full of "happy, smiley people" who do some pretty terrible things when motivated by bad ideas. PS Sam-The NZ government has committed 2 heinous crimes against Maori that it should be held to account for. These crimes have done huge damage to Maori society and delivered huge numbers of them to the underclass. The first was giving Maori seperate representation in Parliament. The second was putting Maori on welfare very early in piece. Both were disastrous moves that need to put right, if Maori are ever to earn themselves their rightful share of this country's bounty. So your hero, Trevor, was a slave owner? Weird. Just shows, doesn't it anon, that even the greatest people can have major flaws in their thinking. "The first was giving Maori seperate representation in Parliament. The second was putting Maori on welfare very early in piece." No some much worse crimes were committed much earlier. The Waikato was invaded just because Maori were exercising their right to freedom of speech and free assembly by setting up the Kingitanga movement. Lots of poor innocent people died. Then later in the same decade the Crown falsely blamed some murders on members of the Tuhoe Tribe. They then sent in the army who launched a scorched earth policy of burning down homes, crops, and people. A bit like what the Indonesian Military has been doing over the past month in Puncak Jaya regency in West Papua or what China did in Tibet (to give an example from a communist country which you can appreciate). Don't be scared Trev to admit that the NZ state has done some pretty heinous things to people. It doesn't make you a PC liberal type. I'm sure your ACT friends will still want to be your friends. "About the only"? Does that mean "not the only"? I would suggest that whether the NZ government has been "comparatively good" is a matter of who you ask. I doubt that Te Whiti, for example, would have agreed. I'm intrigued that you consider this a justification for telling people to put up with things or seek redress through the courts. Even when apparently admitting that Maori were done an injustice by the government's refusal to let them go to court over the seabed and foreshore. This seems to be a rather utilitarian approach rather than the usual libertarian ethical position. I guess you are weakening in your support for people defending their property, now that you are saying they should take the matter to court and just lump it if the court doesn't back them, and seek solace in knowing they have a 'comparatively good' government. Cameron-I'm real suspicious about making such certain judgements on history. I know the propaganda we get today. How do we make a gray world black and white 100 years in the future. Those grievances that can be proven in a court of law should be addressed, the rest should be forgotten. Sam-sorry ACT was the ONLY party. I'm a peace lover Sam. I don't believe in violence except in self defence as a very last resort. Are you saying that force and violence are OK ways of settling perceived grievances? What is your threshold Sam? When does violence become OK? "I'm a peace lover Sam. I don't believe in violence except in self defence as a very last resort." No problem with that whatsoever. I'm in no way fond of violence myself - though I'm not a pacifist, and I will back people using violence when all other avenues have been exhausted (for example, I support the ABSDF guerillas in Burma). The question isn't violence, Trev. It's your assertion that Maori can expect justice from courts set up by those who conquered them. Supposing there's a Marxist revolution tomorrow, Trev (not likely I hope), and they decide to take your house and garden. Are you going to say "No problem, I'll toddle along to the revolutionary tribunual, and if they don't find in my favour, I'll just forget about it?" Sam-if it was the Wild west, I might get out the shotgun. It isn't-its peaceful, stable NZ in 2007. Violence has no place in modern NZ society-agreed? I never mentioned violence, Trev. I asked how Maori can expect justice from courts set up by those who were guilty of the injustice in the first place. I respect your pacifism, however. I'm all for ending violence in New Zealand. Disarming the state would be a good start. they bring in wealthy migrants to take control of our land, industries and business, with thier wealth, when in true fact they should be allowing in the chosen deprived so our local populace can own the land industries and business and employ them.